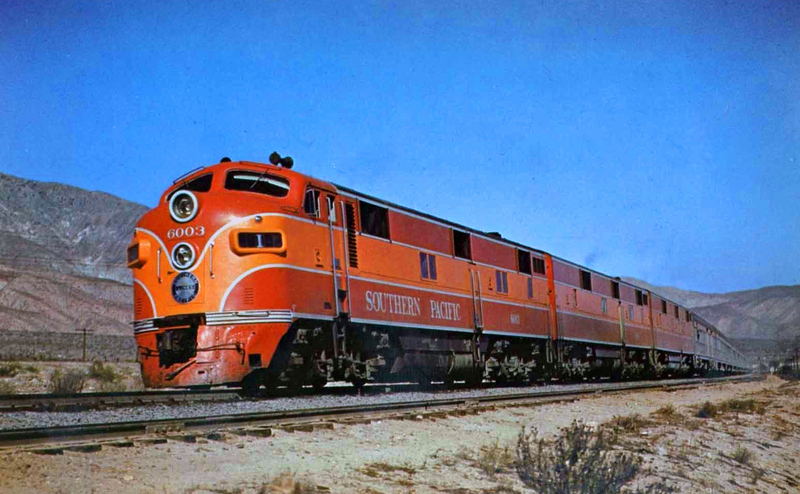 The Southern Pacific Railroad is lauded for the vast and illustrious passenger services it offered over the years and the Sunset Limited was another of these fabled trains. Along with the Sunset other well-known "Espee" passenger trains include the legendary Daylights, the Lark, Imperial, Del Monte, Starlight, and the joint Rock Island Golden State among many others. 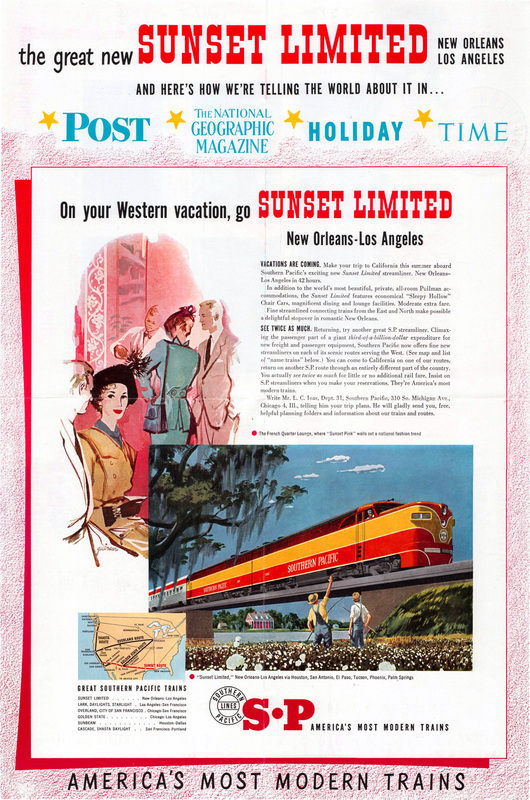 The Sunset was the Espee's premier train serving Los Angeles and the Deep South at New Orleans; the train remained part of the railroad's passenger fleet through the end and was retained by Amtrak when the carrier began service in 1971. The Sunset, when inaugurated by the SP was the oldest named train in the country and today has long outlived its creator. For many years Amtrak had extended the Sunset from New Orleans into Florida's western panhandle. However, after significant damage following Hurricane Katrina this leg to the Sunshine State has yet to be reinstated. Much like the Pennsylvania Railroad was to the State of Pennsylvania so was the Southern Pacific to the State of California, an institutional icon. Also just like the Pennsy the Southern Pacific (also referred to affectionately as the “Espee” by railfans and historians after its SP reporting marks) has such a history that entire libraries of books could be written on the differing aspects of the railroad. The SP was by far our country’s single largest classic railroad (i.e., before the modern-day merger movement began in the 1950s), spanning over 15,000 miles and reaching from the stretches of northwest Oregon to southeast Louisiana! The Southern Pacific Railroad has a whole host of renowned achievements it is credited with, far too many to go into detail here. However, to name a few it had three important main lines which continue as important arteries under Union Pacific today, the Overland Route (San Francisco to the Midwest), the Golden State Route (the Southwest to Kansas City), and the Sunset Route (the Pacific Coast to the Gulf Coast). The Southern Pacific’s Sunset dates all of the way back to the 19th century when the railroad inaugurated the train in 1894 to serve a corridor across the vast reaches of its system, connecting Los Angeles with New Orleans. The Sunset remained a respectable, yet low-key operation on the SP for the first 50+ years of its life using heavyweight, non-streamlined equipment. However, this all changed in 1950 when the train was upgraded with shiny stainless-steel equipment from the Budd Company (over 70 new cars worth about $15 million), complete with EMD E-series diesel locomotives for power which were clad in the Espee’s very popular Daylight livery (later, FP7s took over the train sporting the SP’s red and gray livery). The on board accommodations were quite classy although never quite as luxurious as rival western trains like the Super Chief or City of San Francisco. Still, like its sister long distance train, the Shasta Daylight, the Sunset featured themes of the regions in which it operated such as a lounge car highlighting the French Quarter in New Orleans. While the inherent drawback of the Sunset was its rather bland scenery of flat deserts in the west and swampy buoys in the Deep South, the train still turned out to be quite successful, no doubt in part due to the fact that it reached New Orleans and covered a distance of over 2,000 miles! Listed as trains #1 (westbound) and #2 (eastbound) on Southern Pacific's official timetable the Sunset could make the run between New Orleans and Los Angeles in 42 hours flat carrying an average train speed of nearly 50 mph. 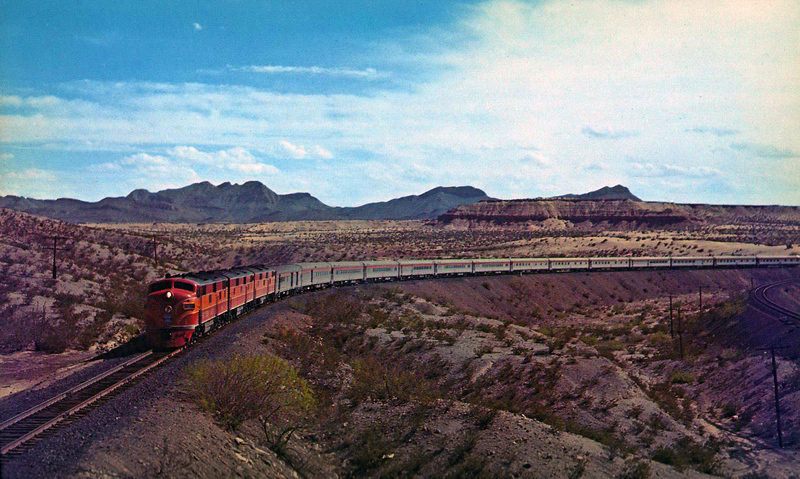 The train was one of the few transcontinental southwest trains to offer through sleeper service as far east as New York City via the Southern Railway, Louisville & Nashville, West Point Route, and Pennsylvania Railroad. If one chose to reach NYC in this manner they could expect an additional 17-hour train ride. 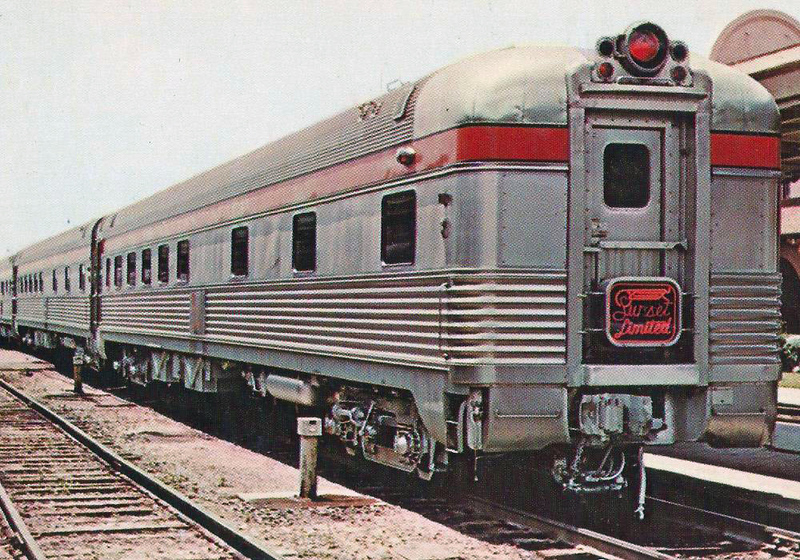 A typical consist for the Sunset Limited included reclining-seat coaches, a lounge, several sleepers (due to through service), a diner, coffee shop lounge (later this was switched to a hamburger grill lounge), and round-ended observation. 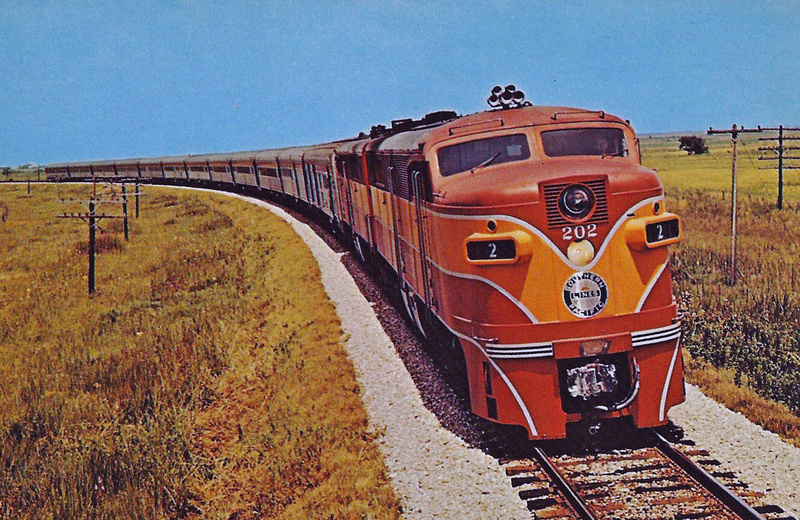 By the late 1960s the SP was having the same problems with its Sunset as were virtually all other railroads with their long-distance, first class train; an increasing loss of ridership due to automobiles and airplanes. While the train was briefly cut down to humiliating coach-only status (with a semblance of dining service) it was reinstated to tri-weekly status with lounges and sleepers upon the urging of the ICC. During the final years the train featured baggage, reclining-seat coaches, and an automatic buffet car. For more reading and information about the train please click here. Needless to say, during these last days before Amtrak the Southern Pacific had all but given up on passenger service, a sad end to a once proud tradition on the railroad. The Sunset remained under this light setup until Amtrak, when the carrier kept the train as part of its new system. Today, the Sunset Limited remains a popular train under Amtrak although its regard has diminished somewhat after the carrier has chosen not to reinstate the train’s original route (under Amtrak) to Tallahassee, Florida for unknown reasons after Hurricane Katrina had knocked out the line for some time. it remains to be seen whether Amtrak will eventually reinstate the train's service all of the way to Florida as it was one of the carrier's most popular under such a routing.